In our last adventure, Laser. Cut. Files. I thought I had it down… sadly, I was wrong, and I’ve actually updated that post, and here’s a Part II to share more of what I’ve learned. This time I once again started with Inkscape, which creates SVG files. From there I export to a DXF file. This is, I guess, not ideal, but it sort of (mostly) works, so I’m still trying to perfect it. Mostly. The issue I mentioned last time involved exporting a DXF file from Inkscape and then not being able to re-open or import that DXF back into Inkscape. I’d get some weird error, which I thought might be due to too much extension madness in Inkscape. Anyway, I ended up re-installing Inkscape and now I can open DXF files, but they just show up blank, so that’s not much better. 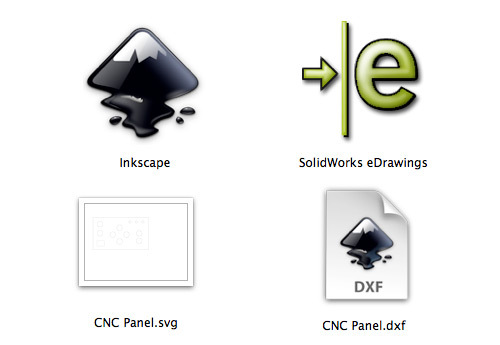 I did however finally find an application for OS X that allows me to easily open and view DXF files: SolidWorks eDrawings. This should help me see what crazy stuff happens to my DXF files between Inkscape on the Mac, and CorelDraw (yuk) on the Laser Cutter. Here’s my most recent file loaded into SolidWorks eDrawings. Hey, look at that! 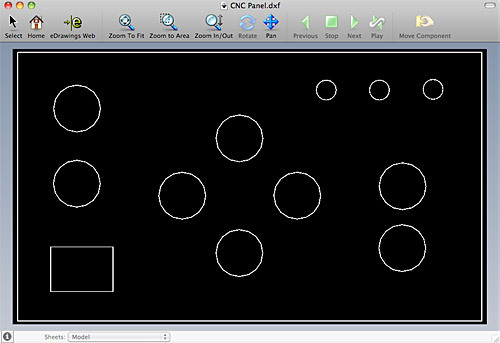 I can view a DXF file on my Mac! And it was much easier than last time, where I screwed around with OpenSCAD to do it. For this control panel, it didn’t really matter, since the front of the button will be covering up the hole, but I’m still not happy with the results… And just so we’re clear, the results I want involve me doing the digital design in tools I can run on my Mac (that I like using) and then getting those files onto the laser cutter PC with minimal screwing around, and just doing my lazzoring. A simple, clean, friction-free, non-annoying process that doesn’t involved having to mess around redrawing things in CorelDraw (yuk) because really, it seems like it shouldn’t be this hard. Oh, and as for the Laser Cutter PC, Inkscape got installed, but I couldn’t get it to work with the Laser Cutter. Illustrator 8 was also installed, which can’t read SVG files, and couldn’t open my DXF files either. So sadly, for now, it’s that damn CorelDraw…. yuk. Update: I made an error in specifying which DXF export I used. I’ve corrected that below. In my previous post Laser. Cut. Wood. I talked about cutting wood on the laser cutter at Milwaukee Makerspace, and I mentioned I wanted to talk about files… so read on. The laser cutter can work with raster files or vector files, and since I last year when I got the Egg-Bot and had to dig into using Inkscape, I’ve become fond of that little open source vector drawing application. I’ve used it for 3D printing and for my cucoloris design. 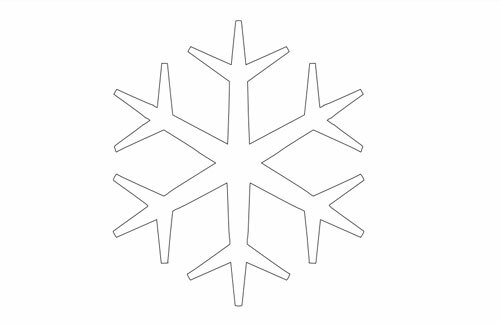 Oh, before I tried the DXF files, I exported a PDF from Inkscape. I figured that since the PDF from BoxMaker went into CorelDraw without issues, it might be worth a try. No dice. CorelDraw said the PDF was “invalid” and couldn’t open it. Preview.app on Mac OS X had no issues, but since it didn’t work, I’d suggest not trying to generate a PDF from Inkscape to import into CorelDraw. I also tried an EPS file, and a PostScript file from Inkscape, since CorelDraw should have been able to open those. Again, no luck. On to the DXF files! 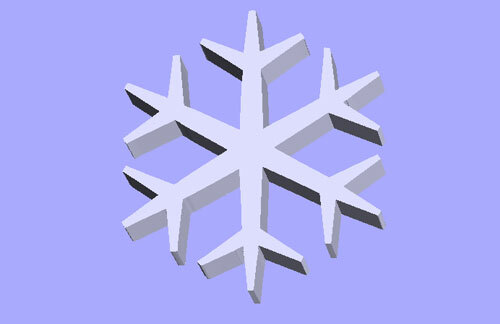 Better DXF The file imported into CorelDraw scaled about 10 times too large. Better Better DXF The file imported into CorelDraw scaled about 10 times too large. 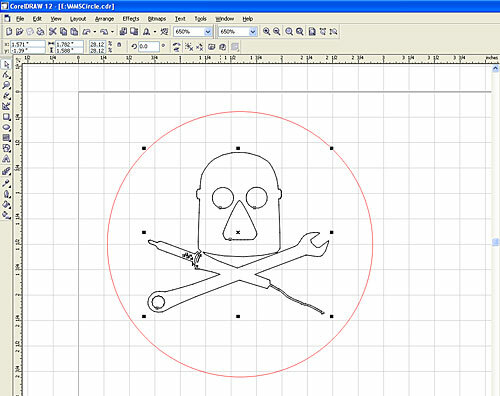 Big Blue Saw DXF The file imported into CorelDraw scaled about 1/4 the actual size. 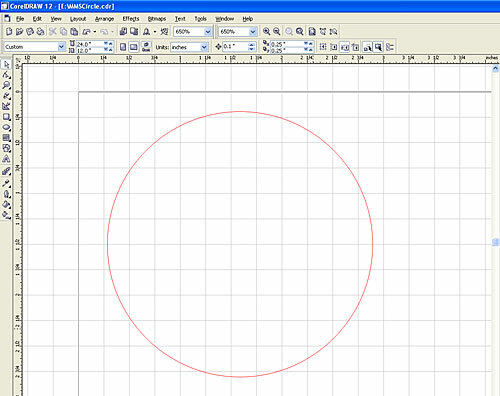 Desktop Cutting Plotter DXF The file imported into CorelDraw scaled about 10 times too large. 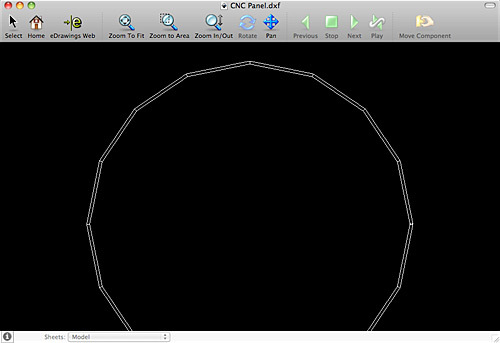 Autocad DXF The file imported into CorelDraw properly. So what worked? The AutoCAD DXF exporter. (Which still made the curves into line segments, so I’m not 100% locked into this, but it worked better than anything else so far.) It actually came in at the right size, which is what I wanted. 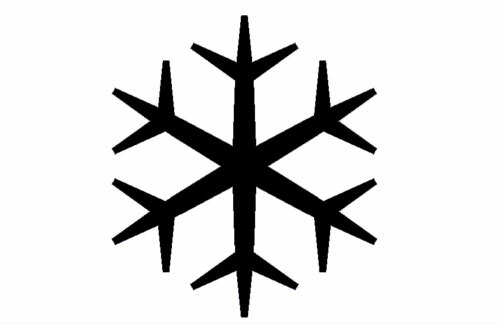 Oh, it’s also worth noting that your vector file in Inkscape should have just a very thin stroke on the lines. How thin? 1 pixel, or less. Less than a pixel? Yeah, somehow you can use 0.05 px as a width. I don’t know how… You can also use 0.001 inches. Whatever, just make it thin to be safe. (And in CorelDraw, set your line to hairline to be safe.) This is fairly similar to what I do for the Egg-Bot, since the width of the plotting pen will determine the width of the line drawn, not the stroke of the line on your screen. So here’s our logo, which we imported into CorelDraw (successfully) and then added a circle around it, in red. To the upper-left of the circle you can see the darker rectangle outline that indicates the upper-left corner of the laser cutter platen. Now here’s where it gets tricky. I was happy with the etching (which was the black lines in the file) but not the cutting around the edge (which is the red circle in the file.) 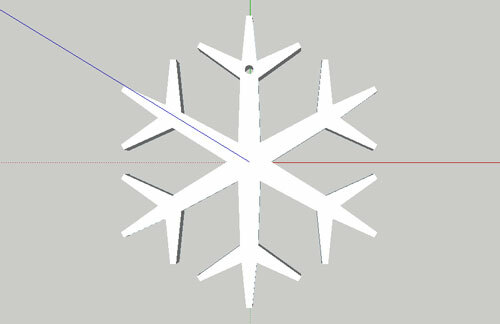 So what I did was, deleted the black lines, left just the red circle, and then sent the job to the laser cutter again. Then I could keep running it until it cut through the wood, without running anymore etching of the logo. Now, I don’t claim that this is the best way to do things, or the only way to do things, but these are my notes, as I’m learning, and I’ll keep adding to them, and will refer back to them, and if things get better, I’ll write that up as well. Oh, I’ve also whipped up a little Laser Cutter HOW TO you might find helpful. 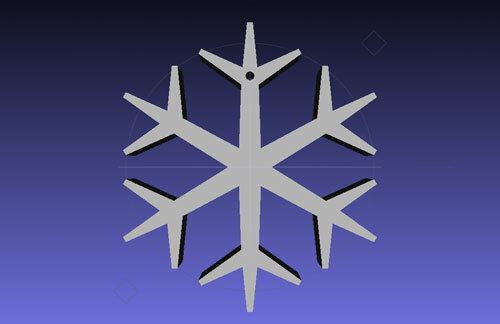 It seemed like a simple enough request… While at Milwaukee Makerspace we were discussing creating snowflakes on the Laser Cutter, and I mentioned that there should be some existing art on OpenClipArt.org, but it was down that night, so I jumped over to Thingiverse and found this snowflake. 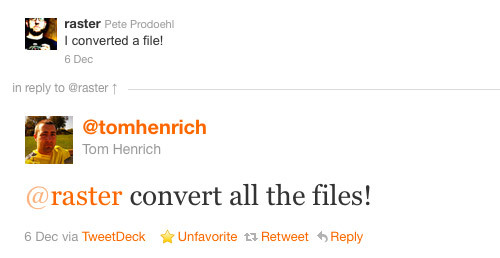 As a bit of background, I’ve been pretty damn good at file conversions in the past. 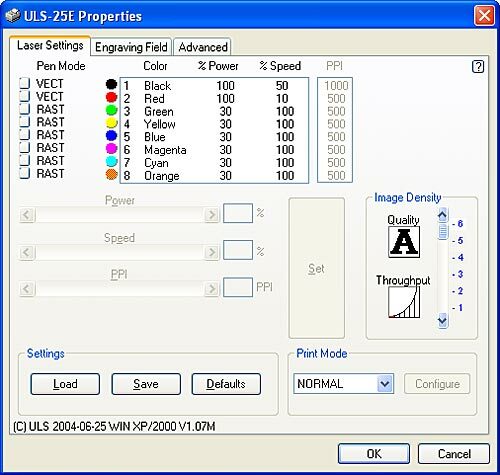 Audio, video, markup, raster images, anything 2D has been pretty simple. I mean, I’ve been using Photoshop since version 1.0.7. I know how to deal with that stuff… but 3D? It’s a whole new nightmare world! The file was an STL, which is meant for 3D printing, but we needed more of a 2D vector file. 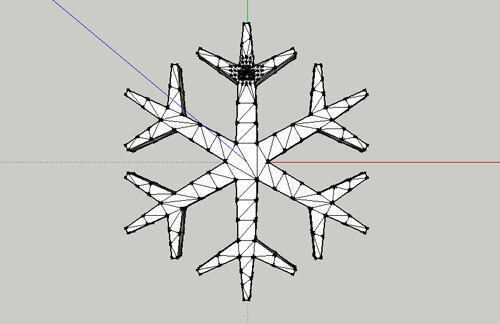 I know how to load a DXF file into the Laser Cutter, so I figured I’m import this STL into Google Sketchup (via a plugin) and then export as a DXF (via another plugin) and that would be it. Well, that didn’t work. (Oh, and by “didn’t work” I mean I was unable to open the DXF file in Inkscape. At this point I was still waiting to use the Laser Cutter so I didn’t get to try importing it on that machine. I figured that as long as I was waiting, I’d try to get a format I knew would work.) On to the next idea. I exported the STL from Google Sketchup as a DAE file, and was able to open that in MeshLab. Once again I tried a DXF export, but that one wouldn’t open in Inkscape either. Argh! So I made a radical decision… Since I could view the file in MeshLab, I just did a screen shot so I could get a nice, clean 2D version of it. Of course if I had known I was going to do this, I probably could have just done it in Google Sketchup by altering the view… Still, the MeshLab method seemed solid. I then took the screen shot and opened it in Photoshop, did a little editing, and converted it to black and white. (I considered creating paths, and exporting them, but at this point I wanted to go with what I knew (or thought) would work, and that meant getting a clean PNG file into Inkscape to convert it from a raster to a vector file via trace bitmap. Oh wait, at some point along the way I had created an OpenSCAD file, to test the other DXF files. They wouldn’t render due to some weirdness, but the new one I exported from Inkscape did. This made me feel a little more secure that this file would work. So how did it turn out? I don’t know! The Laser Cutter was in use making ornaments, and I couldn’t stay late enough to get a chance to use it. And just to be clear… while there were many steps in the process above, the whole thing took about 20 minutes from the first file export to getting what seemed to be a good DXF file. I’ve converted a lot of files in my time, but doing so for these CNC machine is proving to be a new challenge.